Bali is synonymous with Hindu and ritual. Before Bali is known up to a different country, Bali has had its own life and culture. Balinese belief at this time, has been around since time immemorial. But with a variety of influences and relationships between human life, culture in Bali is now more diverse with all the beauty of the display. Although not eliminate the culture and beliefs that have existed since time immemorial, ever since man began to recognize the Balinese social life. Balinese people strongly believe in the existence of ancestral spirits. Ancestral spirits are a guide for the life of the Balinese. In addition to ancestral spirits, since the arrival of people from outside Bali, a Hindu proselytizing mission, then from then on, come on Hindu beliefs, and become one with the religion that has existed in Bali. So as to be a very unique religion, the Hindu Bali. The Balinese believe, every where there are rulers. Ruler of a place, ie god. As with the sea, the Balinese believe that the sea guarded and controlled by the ruling god of the sea. 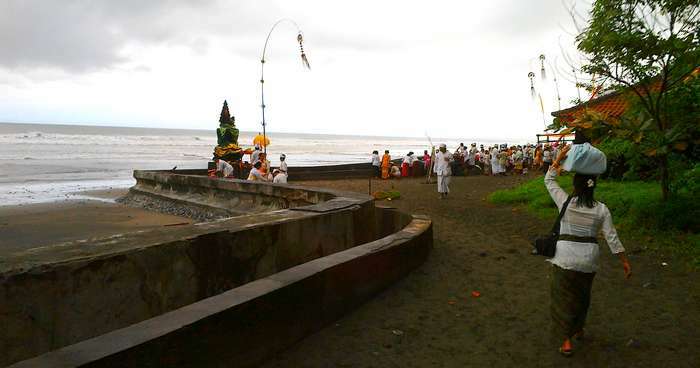 Thus, every beach in an area in Bali, there is a place of worship, to worship the god of the sea ruler. Any given moment, people perform a ritual in Bali sea. Rituals in order to obtain the protection and safety of life. As well so do not get angry and destroy marine life in Bali. By doing the ritual, Balinese people believe that god will not be angry marine authorities. As often happens in several regions in Indonesia. Bali is one of my favorite tourist destinations in the world. It is an island and province of Indonesia, and includes a few smaller neighbouring islands, notably Nusa Penida. I visited this region few months ago after my corning glass center friends. It is the largest tourist destination in the country and is renowned for its highly developed arts, including traditional and modern dance, sculpture, painting, leather, metalworking, and music.